A young man is released from prison and tries to restart his life with a new identity. With the help of a fatherly figure parole officer, the 24 year old begins to experience a coming of age that would have happened years ago, sans his prison stint for a childhood murder. Eventhough the young man tries to keep his true past secret, word spreads through the news and papers that the childhood murderer has been released, raising questions with people who surround him. 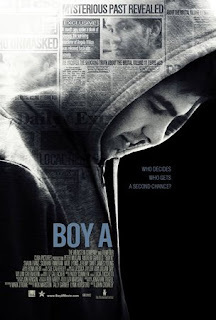 Adapted from the novel by Jonathan Trigell and directed by John Crowley, Boy A is a somber look into a young man as he tries to forget his past and live a normal life outside of prison. Crowley does a great job with the source material painiting the picture of what lead to the childhood murder through flashbacks and current experiences that show the boy has changed dramatically. The film has a nice pace that isn't bogged down for such a dreary story and overall is a touching film. Andrew Garfield plays Jack Burridge and does a poignant job of displaying all the emotions that are jumbled in his mind and past. His boyish attitude in a grown man's body is both vivid and compelling and gives a real compassion for the characters strife. Garfield who shares his character with Alfie Owen playing the young child Eric Wilson who commits the murder with a boyhood friend. Owen does an outstanding job depicting the raw emotions that the unloved boy faces. The combined actors really give a dramatic look into the conscience of Eric/Jack and all he is dealing with. Peter Mullan plays Terry a social worker/parole officer that has sought after Eric/Jack's rehabilitation ultimately giving him the fatherly figure he has needed in his life. Mullan is outstanding in his performance and really adds a whole new level to the film, showing his frustations with his own son and his praise of Jack's progress. His scenes with Garfield are very intriguing and give a thoughtful looks into both characters and their vibrant optimism for the future. Finally, Boy A is a great film that asks the question how can one conform back into society when the society wont allow him to do just that. Director John Crowley does a beautiful job of illustrating the young man's journey and struggles along the way with real compassion towards his inner physiology. The acting throughout is top notch and really allows the viewer to become one with the story and all of its characters. Ultimately Boy A is a great story of rehabilitation that gives a somber look into the life of a troubled and uncared for youth and his later struggle to live a normal life out of prison.